If you’re in the market for a one-of-a-kind 100-foot yacht at a bargain basement price, has Craigslist got a deal for you! This 1985 Naval Academy trawler that took generations of midshipmen on summer cruises, according to the seller’s description, sports one of the “best” hulls built in history, made from double-planked Alaskan cedar. 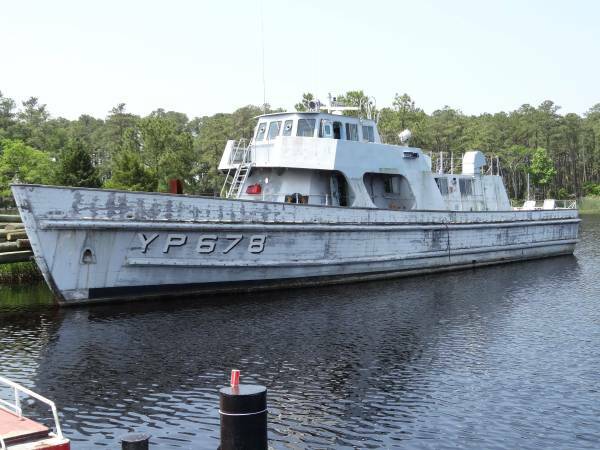 In its former life, the yard patrol boat now billed as the “ultimate trawler yacht” was a training vessel for mids that went on umpteen cruises up and down the East coast, giving mids their first taste of at sea life and liberty ports. The academy is now bringing in a new class of YPs, but it’s unclear how this one got into the present owner’s hands; Navy Times reached out to the owner for its more recent history, but they did not immediately respond to requests. YP 678, once typically helmed by a senior enlisted craftmaster, has five state rooms, three showers, a 15-seat mess deck, massive stainless steel galley, air conditioning and a large main salon. With 1,900 square feet, it’s more spacious than most apartments. But be forewarned: the buyer will need to sink some money into it. All this for only $30,000 bucks. Any takers? We are looking for a decommissioned open rowing boat (whale?) to use as part of our educational Civil War Navy impression a-la the USS Onondaga pix. on the James River, 1865. (18-21″?) We are non profit and poor. Any help will be appreciated. A plastic boat is OK . We have a 10 foot rule. Yes please tell me where it it located or the craigs list ad link. I am very interested. Chesapeake, VA. I took my youngster cruise on this boat – she’s looking pretty sad right now. I want this YP I was an instructor at the Naval Academy and ran many of GQ’s on that YP, tell me where the link is I will come up with the money!!! Pennant 1 for the LANTPAC run to Bermuda 1989…..
Could you please send more photos! Please, could you send more Technical details about the vessel, photos and current location? Would put her up on land and make house out of it. What a project that would be. It does bring back some memories though …. I am interested if you could send me the how too’s and what nots on purchasing please. This is the link for the boat. Did LANTPATs twice with these YPs (OINC). They seem to be selling 678 for the cost of one fuel fill up($30K). Agree with @Rick it would be at least a half million to refurb. Sad to see it in such bad shape. Always thought it would be cool to have one. If an individual or group decides to buy her she’ll need lots of attention. As I’m retired and live in an area (90minutes from her mooring) ripe with boatbuilding/repair yards-I would be willing to act as custodian for YP678 and could manage the restoration process. I’ve been in,on,around and have operated boats for 60 years. Held U.S.C.G. license for over 30 years. Any party wishing to discuss call 609-519-1288. Good luck to the eventual buyer. I am currently a YP engineer stationed at the Naval Academy. If you really want one, wait until we put one up for auction. When we get rid of them, they need about the same amount of work and sell for less. We sold YP 685 at auction. Last year and only got $18,000 out of it.